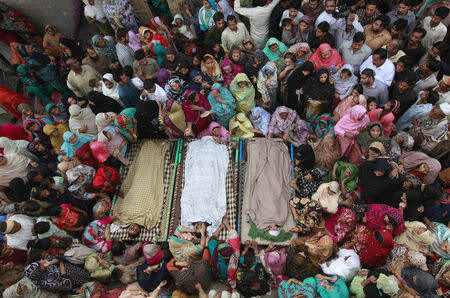 Relatives gather beside the bodies of victims who were killed in yesterday's suicide bomb attack on the Wagah border, before funeral prayers in Lahore, Pakistan, November 3, 2014. PESHAWAR Pakistan (Reuters) - A new Pakistani Taliban group behind this week's devastating suicide bombing on the Pakistani-Indian border said on Wednesday the attack was as much aimed at India as Pakistan, suggesting that Indian targets might be next. At least 57 Pakistanis were killed during a popular flag-lowering ceremony on Sunday when a bomber tried to get as close as possible to the border in a possible attempt to cause casualties on the Indian side as well. Ehsanullah Ehsan, a prominent militant and spokesman for the group, Tehreek-e-Taliban Pakistan Jamaat Ahrar (TTP-JA), said he had warned Indian Prime Minister Narendra Modi that attacks in India were in the pipeline. "I have already conveyed it to Modi ... that if our suicide bombers can carry out attacks on this side of the border, they can easily do it on other side of the border in India," he told Reuters by telephone from an undisclosed location. "I told him that his hands are red with the blood of Kashmiri mujahideen (fighters) and innocent people of Gujarat for which he would have to pay the price." He earlier tweeted in English: "You (Modi) are the killer of hundreds of Muslims. We wl (will) take the revenge of innocent people of Kashmir and Gugrat" (sic). An Indian intelligence official said the account appeared genuine. Kashmir is a disputed Himalayan territory over which India and Pakistan have fought two of their three wars. Gujarat - misspelt in the tweet - is a western Indian state where more than 1,000 people, most of them Muslims, were killed in inter-religious rioting in 2002, when Modi was its chief minister. India has long accused Pakistani militants of trying to attack its targets, particularly after the 2008 Mumbai attacks in which 166 people were killed when Pakistani gunmen went on a three-day rampage in India's financial capital. Ehsan said however that the Sunday attack was specifically aimed at the Pakistani military. The elaborate border parade, which draws hundreds of people every day, is conducted by the military of both sides, making it a target for Taliban militants fighting to topple the Pakistani government and establish an Islamic theocracy. "We have proudly stated that our target was the Pakistani security forces and their installations in which we succeeded," Ehsan told Reuters. The central Pakistani Taliban group, known as the TTP, has effectively disintegrated this year and split into a range of smaller groups such as TTP-JA who appear to be exploiting their ties to al Qaeda to broaden their mission beyond Pakistan. Ehsan said that unlike the TTP's narrow focus on war in the tribal areas on the Afghan border, his outfit sought to attack countries around the region. "The TTP focuses on Pakistan only, while we have a global agenda of jihad ‎and therefore we have people from all over the world including the Arab and Western world for this mission." TTP-JA has announced its support for the Middle Eastern group Islamic State, whose belligerent anti-Western ideology has begun to inspire militants across South Asia. The group's openly anti-Indian rhetoric differs from that of the mainstream Pakistani Taliban, who are mainly focused on their insurgency against Pakistani security forces in the volatile tribal northwest of the country. A successful attack on an Indian target would severely affect the already frosty relations between the nuclear-armed rivals. Shelling on their disputed Kashmir border is an almost daily occurrence, a constant reminder that a full-blown conflict is always a threat. Further unnerving India, al-Qaeda chief Ayman al-Zawahiri, said to be close to TTP-JA, has announced the creation of a South Asia wing of al Qaeda, threatening to stage attacks on countries across the subcontinent. The new group's first major attack was a botched attempt in September to hijack a Pakistani warship and attack a U.S. navy vessel at a base near the port city of Karachi. On Tuesday, India's navy withdrew two warships from the eastern port of Kolkata after intelligence agencies warned of an attack on the port and the city.